Since its first concerts in 1945, the Atlanta Symphony Orchestra has grown from a local youth group to become one of America's major orchestras. The 95-member orchestra is complemented by the acclaimed Atlanta Symphony Orchestra Chorus and the widely recognized Atlanta Symphony Youth Orchestra. Serving as the cornerstone for musical performance and training in an area extending far beyond our city's borders, the ASO reaches nearly half a million people through its various concert series and its diverse initiatives in music education and outreach. Henry Sopkin founded the organization (as the Atlanta Youth Symphony) in 1945, presided over its transformation into a fully professional orchestra, and served as music director until 1966. Robert Shaw, who led the orchestra for 21 years, served as Music Director Emeritus and Conductor Laureate until his death in 1999. Yoel Levi was Music Director of the ASO from 1988 until 2000. Music Director Robert Spano began his duties in September 2001, in partnership with new Principal Guest Conductor Donald Runnicles. In 1988 the orchestra and chorus reached new levels of recognition during their European debut tour, performing under the baton of Robert Shaw. Yoel Levi led the orchestra on its second European tour in 1991, presenting sixteen concerts in cities including London, Paris, and Vienna. The ASO, ASO Chorus and ASO Youth Orchestra were also prominently featured in the Opening and Closing Ceremonies of the Centennial Olympic Games in 1996. Maestro Robert Spano has led an innovative period for the ASO that has included musical commissions and commissions for video and animated installations in the concert hall as well as video interviews with living composers and a greater emphasis on contemporary repertoire. The ASO has recorded extensively, drawing international praise by winning an Audio Excellence Award, Gramophone and Ovation Magazine Awards, and 27 Grammy Awards. The ASO records on it own label, "ASO Media" with additional releases available on Telarc, Deutsche Grammophon, Argo, New World, Nonesuch, Pro Arte, Sony Classical, and Vox. The orchestra's annual King Celebration concerts (since 1992) honoring the legacy of Dr. Martin Luther King, Jr., held in the Martin Luther King Jr. Chapel at Morehouse College, have grown to include symposiums, chamber-music concerts, and other related events. Guest artists have included Billy Taylor and his Trio, André Raphel Smith, Faye Robinson, Avery Brooks, Indra Thomas, Coretta Scott King, Andrew Young, Maya Angelou, Charlayne Hunter-Gault and Korva Coleman. A participant in the National Black Arts Festival since its beginning, the ASO joined with the festival in 1994 to sponsor a competition for new compositions by African-American composers. The orchestra also treasures its relationships with area churches, with concerts given in collaboration with Ebenezer Baptist Church, Cascade Road United Methodist Church, Cathedral of the Holy Spirit, North Avenue Presbyterian Church, Johnson Ferry Baptist Church, the Temple, and Cathedral of St. Philip, among others. The ASO's innovative Talent Development Program (TDP) identifies promising African-American and Latino musicians of school age and provides them with lessons, performing experience, and scholarships to summer music camps. A number of TDP students have qualified for membership in the Atlanta Symphony Youth Orchestra and the Georgia All-State Bands and Orchestras. TDP graduates are now studying at several conservatories and college schools of music. The ASO has launched a number of ambitious outreach partnerships that take the orchestra's musicians, individually or in groups, into the lives of school children who otherwise would never meet a professional musician. Most of the ASO's players regularly volunteer their time for these activities, in partnership with local school systems, arts centers, libraries, and other organizations. 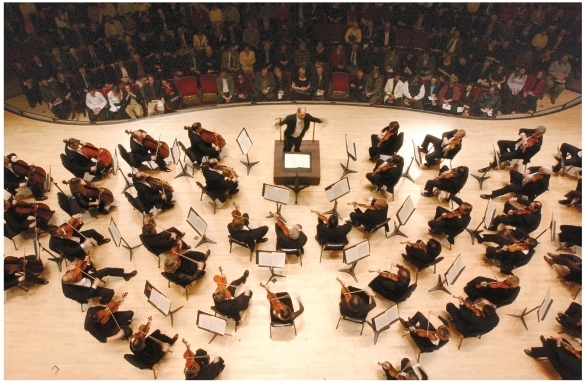 Through partnerships with Georgia State University, the Rialto Performing Arts Center, and the national Sphinx Competition, the ASO provides expanded performance and educational opportunities for many budding musicians.